Smack dab in the middle of Santa Rosa, lies the Luther Burbank Home and Gardens. Luther Burbank is an icon in the world of horticulture, known for cross-breeding all sorts of edibles and ornamentals. Locally, while praising him for his accomplishments, we also like to hold him responsible for some of the worst plant allergies we’ve ever known due to his grafting of both non-indigenous and local species. Dave and I decided that being later in Spring, we could probably enjoy the gardens without extreme reactions to pollen. My intention for the outing was to find reminders of how nature illustrates her own healing and in that, mine. Before we got to the white picket fence of the gardens, Dave and I drifted off into our own worlds, me with my camera and Dave with his curiosity. Our walks overlapped on a few occasions and we talked about the contributions Burbank made to agriculture and beauty. Mostly, though, we just wandered. I spent time with roses, of course, noting breeds I would most like to have in my yard and those I already do. I was drawn into the brilliant colors of a wide variety of poppies, especially as they contrasted with the nearby cacti. 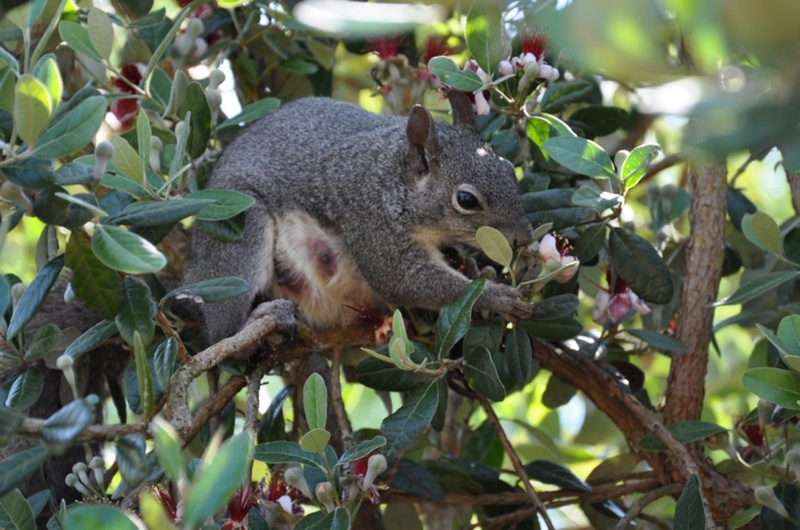 Several squirrels entertained me, one frantically munching on the fruits of an unfamiliar tree, her pregnant belly protruding over the branches. Usually not a big fan of insects in close proximity, I felt somehow drawn to them as they feasted on the nectars of small, white, star-shaped-bell flowers. I kept thinking how odd it is, that this place of wonder is surrounded by the traffic and noise of a bustling downtown – all of which disappeared into a silent backdrop of those things that don’t matter when nature speaks to me. I listened to her voice and she said simply: A time to weep, and a time to laugh; a time to mourn, and a time to dance. Nat dropped by for a visit in mid-evening. We sat on the patio in the warm sunset breeze and talked of our trip to the gardens; he told us about work and showed us photos of Ruby and their baby chicks, teenagers, already (the chicks, that is). We were aware that everything is moving along in time. We acknowledged the date, though briefly, had a laugh on Owen’s behalf, and made plans for a Memorial Day barbeque this afternoon. Yesterday marked the fourth year anniversary of Owen’s last day on the planet. Turn, turn, turn. ~ by Linda on May 30, 2011.